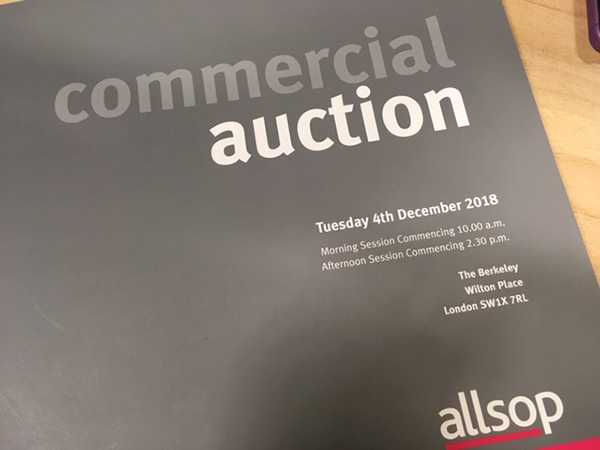 Allsop’s final commercial auction of the year on 4th December will see 144 lots offering a total income of £7.5m per year. The auction catalogue, which has now been released, features a broad variety of investments from across the sector with yields ranging from 3.5% in London to 15% for some regional retail assets. Alternative investments, which have been steadily growing in demand, are anticipated to be sought-after. This includes a portfolio of four job centres, all let on leases expiring in 2027. Located in Newquay, Yeovil, Accrington, Caerphilly and guided from £600,000-£1,35m, yields range from 7.5%. In addition, Lot 87, a hotel in Brierley Hill, with 32 bedrooms let to Travelodge until 2039, generates £89,000pa and is guided at £1.4m to £1.5m, 6% net. Lot 90, a car park in Swansea spanning 2.89 acres, let to Virgin Media until 2039, generates £112,500pa and is guided at £1.6m – £1.7m. December’s auction will offer 16 lots located in London with guide prices ranging from £200,000 to £2.5m. This includes Lot 81, an attractive shop with three residential bedsits above in the heart of Marylebone Village. Guided at £2.1m – £2.2m, it is the second highest value investment in the catalogue. Lot 85, a shop and office investment in Sevenoaks is the highest value asset to be offered. Guided at £2.5m, tenants include Santander, Specsavers and Oxfam. One of the more classic High Street disposals in the catalogue includes the breakup of 78/84 High Street in Bromley, let to Boots, Metro Bank, St Christopher’s Hospice and Harvey and Thompson; all are being offered with the residential upper parts as Lots 7,11,18 and 24. The auction will take place on Tuesday 4th December at The Berkeley, Wilton Place, Knightsbridge, London SW1X 7RL. The catalogue can be viewed online.